The team at St. Lawrence Erectors, a subsidiary of Canam Group, successfully executed a large-scale lifting operation over the Lachine Canal in the scope of the KPH Turcot design-build project. A 164-foot (50-meter), 300,000-lb (136,000-kilo) section composed of two preassembled steel girders was lifted over the waters of Lachine Canal. The crane used to lift the section, which will form part of the new Highway 15 bridge over the canal, has a 650-imperial ton (700-metric ton) lift capacity. Two other cranes were then required to maneuver the component to which the section would be connected and install it on the new bridge structure. The three cranes operated simultaneously in a very restricted area, beneath Highway 15. It goes without saying that all the necessary health and safety precautions were taken. A rescue procedure using a boat was put in place, which is a must when such operations are conducted over water. Congratulations to the St. Lawrence erectors team on their successful execution of this high-precision operation, which was carried out safely and smoothly. 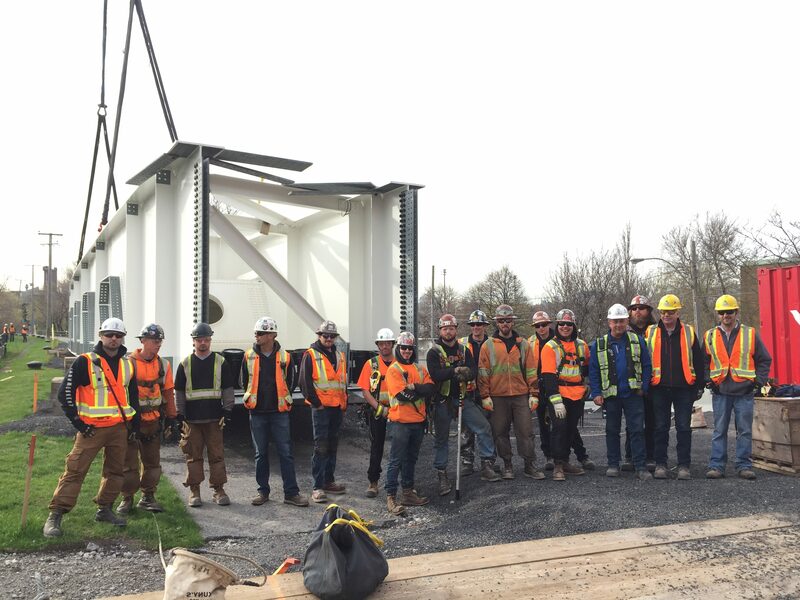 The St. Lawrence Erectors team, as they prepare to start the operation to lift the 300,000-lb (136,000-kilo) girder section over the Lachine Canal.